My name is Clare and I have two daughters at Florence Melly – Macy in Year 6 and Madison in Year 4. I work as a VAT Tax Specialist within HMRC and I am currently completing a BA (Hons) degree in Professional Taxation. 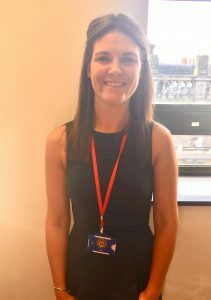 I became a parent governor in June 2016 following an Ofsted inspection of the school. As a parent I wanted to understand what had led to that Ofsted report and to ensure that our children were being provided with the best education possible at Florence Melly. Having seen the work that goes into educating our children and how dedicated the staff are, I am confident that this is the case. My girls and I love Florence Melly and thoroughly enjoy all of the brilliant events, activities and opportunities that our school provides for the children. I know my girls will look back on their time here with fondness. My name is Janet and I am the Vice-Chair of Governors. 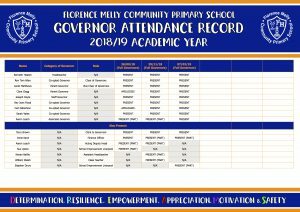 I attended Florence Melly myself and after my eldest daughter and son had been in the school a few years a vacancy became available on the governor body and I applied to become a parent governor in 2014. I really enjoyed being a governor and when my parent governor term came to an end, with the backing of the full governing body, I became a co-opted governor in 2018. 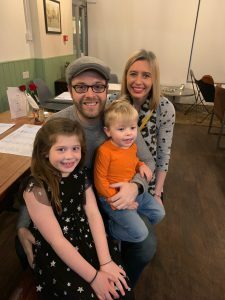 After receiving a lot of help and support when Ben (who has significant special educational needs) started in the Nursery, I really wanted to be able to help the school move forward and support and challenge the staff. I have a particular interest in Safeguarding and SEND, I am an active member of PATCH and I really enjoy volunteering in the school library. 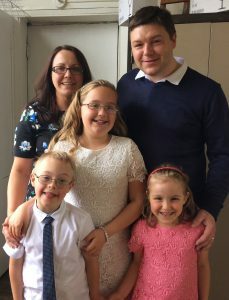 I am married to David, who is a chef in Alder Hey and we have 3 children…Ava who has now moved to Year 8, Ben in Year 3 and Chloe in Year 2. 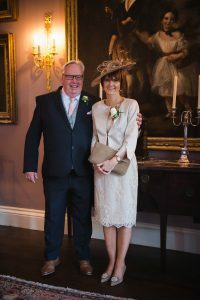 My name is Aaron Leach and I am the Deputy Headteacher and an Associate Governor at Florence Melly. I live in West Kirby with my partner and two wonderful children. I have worked in our school for seven years and really feel part of this community. I initially came to the school as a student teacher and was lucky to secure a teaching post in Year 5 a couple of years later. I have experience of teaching across the phases from EYFS to upper Key Stage 2 and have worked in requires improvement, good and outstanding schools. I am also a Governor at another school with responsibility for Pupil Premium and Assessment. grandchildren up to now! Florence Mell y is a great school which takes community seriously. I am always amazed by the connections with local, and national, groups that are made for the benefit of the students. 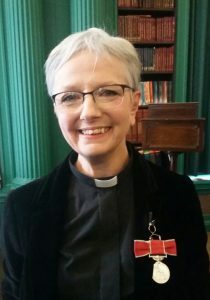 We hope that the connection with St Aidan’s adds to their education in ‘British Values’ but also extends their learning about the importance of the global community My prayer is that they enjoy their school now and can look back with gratitude and happiness on their primary school days. I’m sure they will. 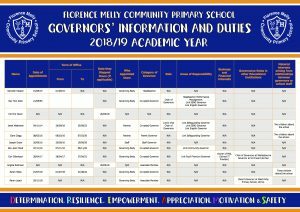 This document explains how the governing body of Florence Melly Community Primary School is constituted. Section 20 of the Education Act 2002 requires all maintained schools to have an instrument of government which determines the constitution of the governing body and other matters relating to the school. Part 5 of the 2012 Constitution Regulations makes provision regarding the contents and form of the instrument and the procedure for making and reviewing it. This document contains details about the structure and responsibilities of the governing body. It also identifies the dates of appointment, term of office, dates where governors have stepped down and who appointed each governor to post. 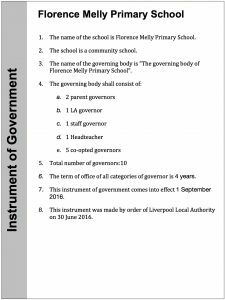 This document shows any business and financial interests the governors may have, any other governance roles they hold in other educational settings and any material interests arising from relationships between governors and/or school staff (including spouses, partners and close relatives). 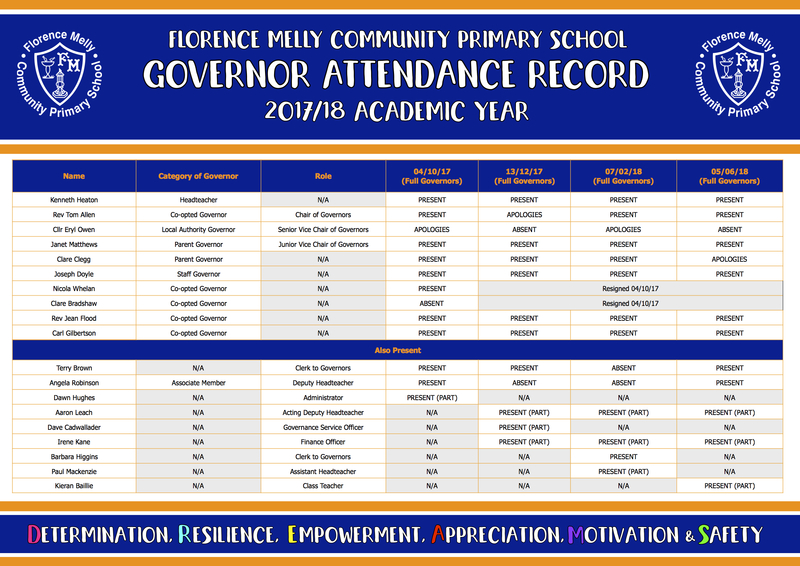 This document contains information about governor attendance at governing body meetings for this academic year. It will be updated after each governor meeting. 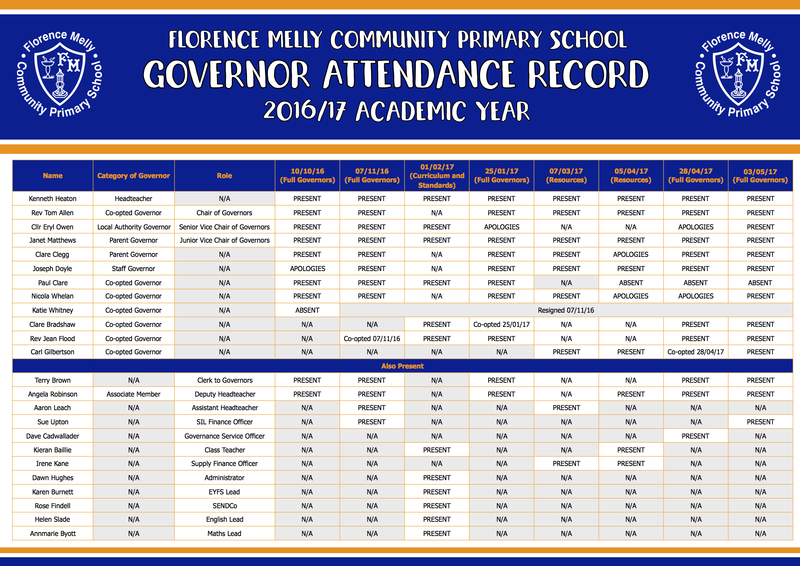 This document contains information about governor attendance at governing body meetings for the 2016/17 academic year.